Kids love science like peanut butter loves jelly. So if you're visiting Boston with kids, be sure to stop by the Museum of Science: "kid-friendly" doesn't begin to describe it. The MoS's exhibits – including over 700 interactive ones – are so hands-on, so beautifully geared toward the enjoyment and excitement of science, it's a perfect fit for the curious kid in your life. Here are six of the must-see exhibits for you and the kiddos to enjoy. Upon entering the museum, you'll encounter Archimedean Excogitation, the audiokinetic sculpture by George Rhoads. You can't miss it – it's a 27-foot tall sculpture that demonstrates the relationship between potential and kinetic energy through a complex system of chutes, balls, gears, paddles, and pulleys: picture a huge Rube Goldberg machine, forever in motion. No one – and I mean no one – gets more excited over dino poop than kids do. That, along with bones, footprints, and other dino artifacts, will turn any curious kid into a mini-paleontologist. The exhibits' centerpieces, however, are a full-size model of a Tyrannosaurus rex and "Cliff," a 65-million-year-old Triceratops fossil. Older kids will be impressed that it's one of only four nearly complete Triceratops on public display anywhere in the world. 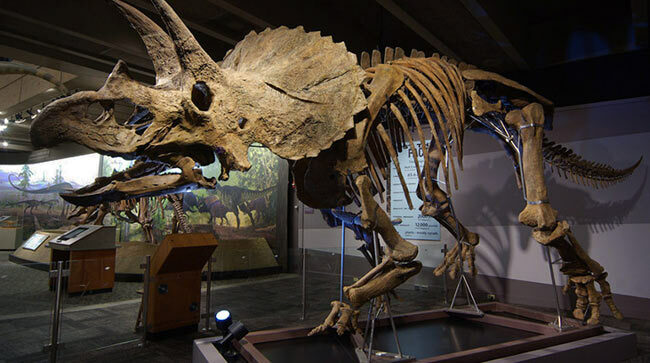 The 65-million-year-old Triceratops fossil at Museum of Science, one of only four on display in the world. Photo © Emily Roose. When my kids see this exhibit from a distance – essentially a playground inside the museum – they immediately bolt for it. Science in the Park takes everyday play objects like seesaws, slides, balls, swings, and bicycle wheels, and shows how they demonstrate scientific concepts like mechanical advantage, leverage, momentum, and force. Kids can participate in their own experiments, like racing a set of lights down a track to measure their speed, or twirling ice-skater style, seeing how different ways of positioning their legs contribute to or hinder their momentum. It's the principles of mechanics, literally brought to life. Upon entering the Theater of Electricity, you'll immediately see what looks like two giant metal spheres on pedestals: the world's largest air-insulated Van de Graaff generator. What, you may well ask, does a Van de Graaf generator do? 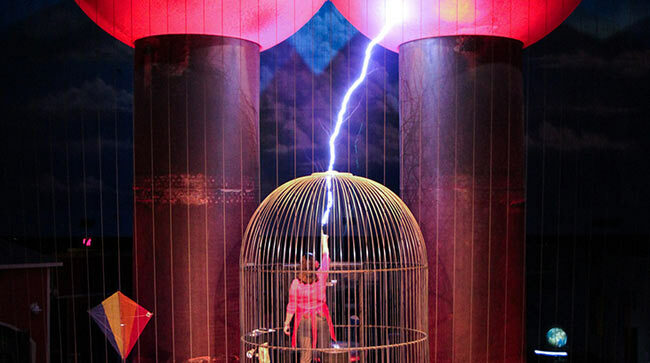 As you'll see demonstrated in a live, loud, edge-of-your-seat 20-minute show, it creates lightning. (Note that this show may be better suited for ages seven and up; younger ones might be afraid of the loud noises and flashes.) The show runs at certain times throughout the day; check the schedule beforehand so you can grab a good seat. Lightening created in the Van de Graaff generator. Photo © Nicolaus Czarnecki. 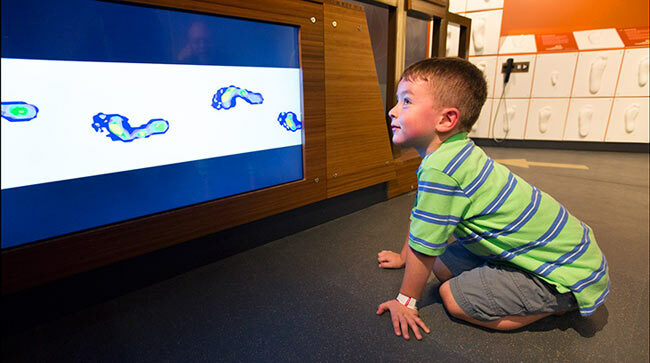 Kids love to learn about their bodies, and many aspects of human biology – from your DNA to what you eat to where you live – come to life through 70 interactive exhibits. Kids will love exploring questions like "How well can you keep your balance?"' "How does your body grow? ", "Why does one person get cold faster than another? ", "Why are some faces easier to recall than others? ", "How efficient is your walk? ", "Does the sight of an animal change your pupil size? ", and "How easily are you distracted?" My kids usually gravitate to the Exploration Hub, where they're mesmerized by a hive of honeybees and an incubator with chicks hatching. Among many hands-on activities, they can piece together a skeleton, learn about nutrients in different foods, examine a dissection of a sheep's eye, and visit some cotton-top tamarin monkeys. Kids learn about how their bodies work in the Hall of Human Life. Photo © Michael Malyszko. If you have little ones in tow, put the Discovery Center on your must-see list: It's especially created for babies, toddlers, and young children, with an "Experiment Station" for trying different experiments and building projects. Kids (little and big) will also get a thrill out of Live Animal Story Time, presented at various times throughout the day (Shapiro Family Science Live! Stage, Green Wing, lower level). 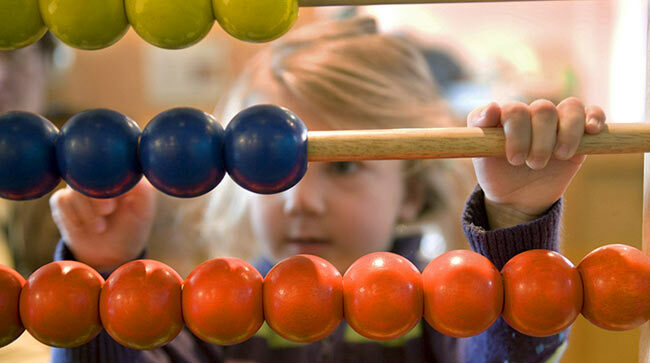 An abacus for little ones in the Discovery Center. Photo © Michael Malyszko. Finally, be sure to check the current offerings for the 4-D Theater, the Charles Hayden Planetarium and the Mugar Omni Theater's IMAX screen. As of the time of this writing, the 4-D Theater is presenting The Polar Express 4-D Experience, the Planetarium is showing The Magic Tree House: Space Mission (required viewing for fans of Jack and Annie! ), and the IMAX is showing Pandas: The Journey Home. While all of these require additional ticket purchases, they'll make your MoS experience truly spectacular.